The runners await the off. Grey but not raining at this point. A little over a year ago, spurred into challenging myself by a combination of boredom and the marathon-running example of my younger brother, I signed up for the Focus Ireland Triathlon. Not having done any serious exercise in years, I was pretty happy to finish the event, let alone do so in the middle of the field. A longer-lasting effect of this success was that I decided to make an effort to maintain my fitness and maybe enter the odd event or two. That was how I ended up at the Point Village this morning, waiting with a few thousand others to begin the Focus Ireland Tunnel Run, a 10k race through the twin bores of the Port Tunnel that links Dublin’s docklands to the north of the city. Sunday morning may not be the best time for exertion, but it’s a habit of mine to run and swim on a Sunday, so it wasn’t a complete shock to the system. My preparations could have been more professional though: Saturday night drinks with friends and only five hours of sleep, most of which were pretty restless and dominated by dreams of giant spiders – interpret as you will. My goal for the run was to finish in 45 minutes or less. Although this was only my third 10k run in the year since the triathlon, I’d managed 46 minutes on the Samsung Night Run, despite pouring rain, an overcrowded course, a futile attempt at shoelace-tying, and the decision to wear my rain jacket all the way through. The other 10k run had taken place the week before the Focus Ireland event, a more leisurely solo run along the coast near home in Northern Ireland. This was the first time that the Port Tunnel had been closed for runners. 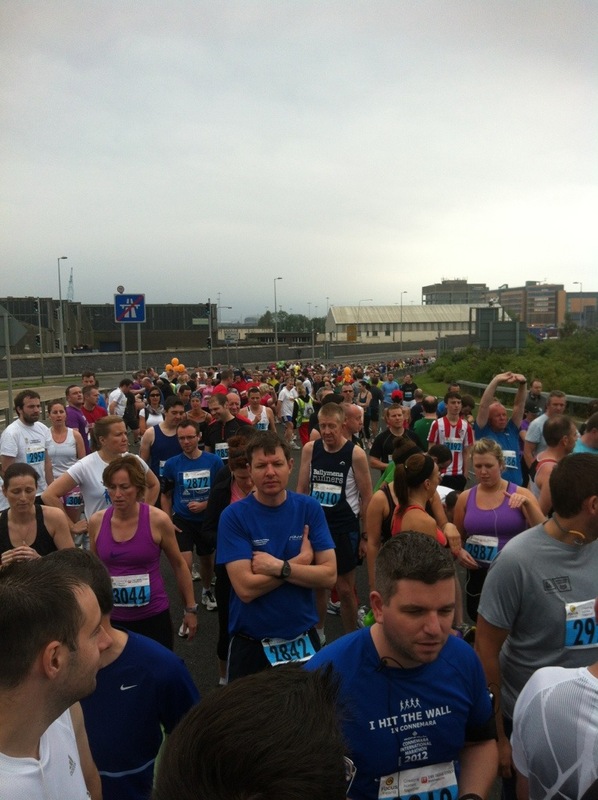 A previous 10k event had taken place just before its grand opening, but Focus Ireland had managed to secure it for three hours, hopefully not inconveniencing the Dublin traffic system too much. Organisationally, it all went pretty smoothly, apart from a few glitches, like the Bootcamp Ireland warm up music drowning out the official announcer just before the start. What the announcer was trying to tell us about was a last-minute change in the plans for the start. Initially, the idea had been for the runners to start in waves, fastest first, presumably to prevent crowding in the two-lane tunnels. Instead, were all released together, shuffling towards the start and then pushing hard for position as we escaped the starter lane. Whatever the reason for the change in starting protocol, crowding proved an illusory problem. The wide toll plaza gave everyone room to run at their own pace before they hit the first tunnel, sorting out the strollers from the runners. During the much more crowded Samsung Night Run, I’d found myself stuck well back down the order at the start, meaning that when I had the chance to run at pace, I was able to target runners ahead of myself and overhaul them. Being nearer the start, I had few slow runners ahead of me and was overtaken as often as I overtook. Still, running as part of a pack makes it easier to pace yourself, and I felt pretty comfortable after any initial stiffness faded away. Running through the tunnels proved a strange experience: long, sweeping curves; gentle slopes that were difficult to gauge due to the lack of a horizon; and absolutely no wind. The air didn’t get as stuffy as I’d feared, but it might have been worse for those further behind. There was plenty of space too, and there was more and more as the race went on. Adding some amusement to the run was the fact that the lightboards used to deliver warnings to traffic were instead filled with messages of encouragement for runners, presumably tunnel staff or their family members. The first tunnel was the tougher of the two, with a long uphill stretch towards the end, and it was a relief to see daylight and the water station at the halfway (actually just over halfway) mark. Quick sips solved any dehydration problem that had lingered from the night before, and the long, gentle downhill slope that began the second tunnel allowed me to push harder as I began the run for home. Other runners must have had a similar idea, as I was overtaken more than I overtook once again, but as soon as I hit the flat, that changed. I had targets in front of me again, and I knew I was closing on the finish line. The appearance of daylight at the far end of the tunnel was cruelly deceptive, bouncing as it did off several curving walls that marked the end of the hardest uphill stretch of the whole run. Still, the announcement that there were only 500 metres helped me to summon up what energy I had left and head for the line as fast as my tiring legs could take me. Not quite fast enough, as it turned out. My own timekeeping marked me at 45 minutes and 3 seconds, which the official results would later amend to 45 minutes and 21 seconds. Even so, that was a personal best, placing me 161st fastest among the runners on the day, and far better than I would have considered myself capable of a year ago. I barely noticed the rain as I trudged back to the Point Village to collect my bags. Though to be fair, the rain may well have been steaming off my overheated shoulders as I recovered my breath. Although it wasn’t quite an Olympian endeavour on my part, it’s hard to be unhappy. A year ago, I hadn’t run in almost 20 years, hadn’t cycled in almost as long, and was at best an indifferent swimmer. The changes since then have contributed a lot to a year that’s been all about rebuilding and expanding my horizons. The simple satisfaction of being in shape and being able to challenge myself and come out on top is a well I plan to keep going back to.